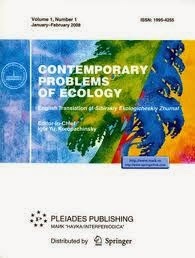 Top ecology paper. Score: higher than 82% of its contemporaries. Go to the Springer web-site with more information on this paper. You can tweet this reference from the Springer web-site. Your followers will consider you a source of interesting and valuable scientitic information. Earlier, the author published two books and some papers, in which he described conceptual foundations of new scientific disciplines — biochemical ecology and biochemical hydrobiology. These trends in research include studies of the role of chemical substances in interorganismal interactions, in communication and regulation of supraorganismal systems. Another part of biochemical ecology concerns studies of the destiny and transformation of external chemical substances when they interact with the organisms. Both natural and man-made compounds are interesting for biochemical ecology. The basic concepts of biochemical ecology include ecological chemomediators and ecological chemoregulators that have already been included in the body of modern conceptions and are used in modern ecological literature. Application of biochemical ecology to aquatic ecosystems creates the basis for development of biochemical hydrobiology. Original Russian Text © S.A. Ostroumov, 2006, published in: Sibirskii Ekologicheskii Zhurnal, 2006, Vol. 13, No. 1, pp. 73–82. Older articles will score higher simply because they’ve had more time to accumulate mentions. To account for age we can compare this score to the 278,655 tracked articles that were published within six weeks on either side of this one in any journal. This article has done well, scoring higher than 82% of its contemporaries. More generally, Altmetric has tracked 2,798,442 articles across all journals so far. Compared to these this article has done well and is in the 82nd percentile: it’s in the top 25% of all articles ever tracked by Altmetric.